The visit to La Casa Blanca was bien chivo although President Obama wasn’t around to welcome me as I had hoped. I didn’t tweet or blog until now because between waking at 4 a.m. for the White House tour and preparing for our trip to Miami, I’m just super cansada. When you first walk in there are photos of the Obama family on the walls of the foyer. The very first photo prominently displayed, was President Obama with mariachi. I instinctively reached for my non-existent camera before remembering – no cameras allowed so I hadn’t brought it. I did find the photo on the internet though so you can see. There are various rooms named for colors – The Blue Room, The Red Room (which looked hot pink to me for some reason – but I loved it), The Green Room, etc. “The artist of that painting,” I said. “No, the other Jacob you loved,” he said narrowing his eyes. He didn’t believe me for several minutes that ‘Jacob Have I Loved’ is the name of a book. Once we were outside, we were allowed to take photos, so I took a few with my cell phone camera. 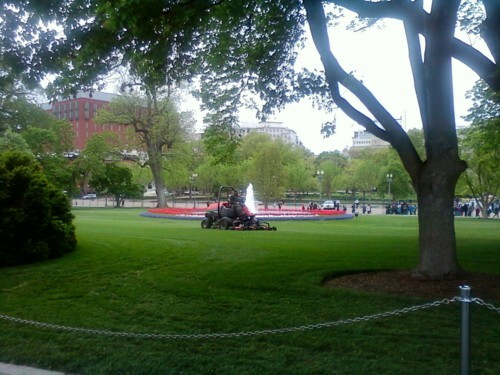 White House lawn being cut. The future 1st Latino President and his hermanito. Next I’m in Miami, trick! I love it… y tus hijos bien guapetones igual ke el Presidente… no mas listate con el grande… o pronto te digo suegra jajajaj jk jk jkjk pero bonita aya… regressate pronto! What a fun trip! I forgot “no cameras allowed” inside. I’m going to have to check out that website about Obama looking bored. Too funny! Dale!!! Si tu hijo va de presidente, desde ya cuenta con mi voto. Sólo pido a cambio algun puesto de Embajadora (pero no en Medio Oriente, gracias)!!! Qué bonito paseo! Nosotros pensamos hacerlo a finales de Mayo. Pero creo que tienes que reservar tus entradas como 6 meses de anticipación no? Si es así, que se conforme Obama de verme parada en la calle!!!!! 6 meses no es necesario, pero si tienes que pedirlos muy antes de tu Congressperson, (at least 21 days before the day you wish to go.) Buena suerte! Seriously, no photos inside the White House…after all the taxes we pay! But I guess for security it makes sense. I can’t tell you how many pictures of the White House lawn I’ve seen. That was very first one I have *ever* seen of someone mowing it. There must be a story in there somewhere. I’d love to visit anyway. These walls must have heard all the secrets! :) I always wondered how they manage to keep the privacy of the president and his family when they have so many tourist visiting each week. Now I know! BTW, how could President Obama be bored with mariachi playing their heart out? I say he was soaking it in! I’ve been once only to DC, and that was for all of a few hours for an interview. 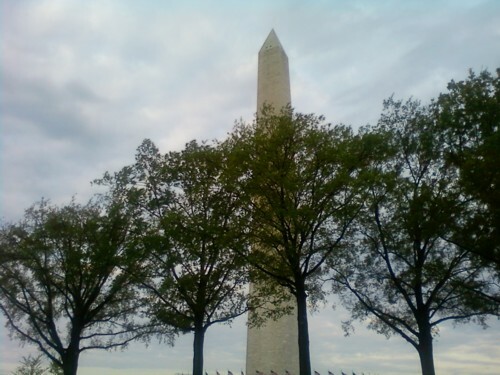 Have always wanted to visit the monuments. Thanks for sharing your family’s experience. It sounds like you enjoyed yourselves. Have always wondered about security on the grounds and inside. Is it like on TV with guys in black suits and ear-pieces standing all over the place?